This is a touching and funny story mainly about a girl and her new hamster, but it is also about a family dealing with significant change. Dad has left and nine-year old Jeannie and her twelve-year-old brother Alistair don’t understand what is happening. By the end of the book Dad reveals that he is gay. Mom has become friends with a transgender neighbor and Jeannie likes and accepts her but Jeannie needs to reconcile what she knows to be right with a friend’s discomfort. The story teaches acceptance of differences and of being who you are. These themes are presented in an age-appropriate and sensitive way. It is told from the point of view of Jeannie alternating chapters with the point of view of her hamster Sapphire. The book grabbed me right away and had me laughing at the end of the very first chapter. 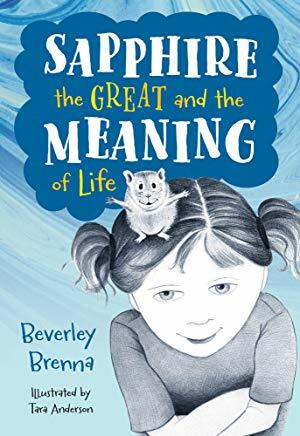 The chapters narrated by Sapphire are amusing, I loved the stream of consciousness feel as Sapphire finds her way in the world and tries to figure out the meaning of her life. The hamster’s thoughts were very convincing, just what one would imagine a hamster would be thinking. Almost every illustration at the beginning of each chapter is the hamster character, these are excellent black and white pencil drawings which illustrate the personality and emotion of the animal. To whom would you recommend this book? Grades 3-5.
Who should buy this book? Elementary School Libraries, Public Libraries. This entry was posted in *Starred Review, Book Review and tagged Pajama Press. Bookmark the permalink.